During last few years, UAE witnessed substantial growth in commercial telematics systems owing to growing number of commercial vehicles across the country. Deployment of telematics hardware in heavy duty commercial vehicles has been low and was primarily noticeable across construction and logistics sectors. Installation of telematics systems surged following the government regulation to install GPS tracking system in public transport system such as rental cars and taxis. Rising security concerns among truck and car fleet owners have further resulted in an increase in demand for telematics systems in the country. According to 6Wresearch, UAE Commercial Vehicle Telematics market is projected to grow at a CAGR of 7.5 % during 2018-24. Dubai Transportation Authority is planning to add 3,268 new taxi by 2020. This would further propel the growth of commercial telematics market in UAE. Amongst all the sectors, vehicles under logistics and transportation were key adopters of telematics system in UAE. Significant growth prospects lies ahead for construction, government and infrastructure applications. 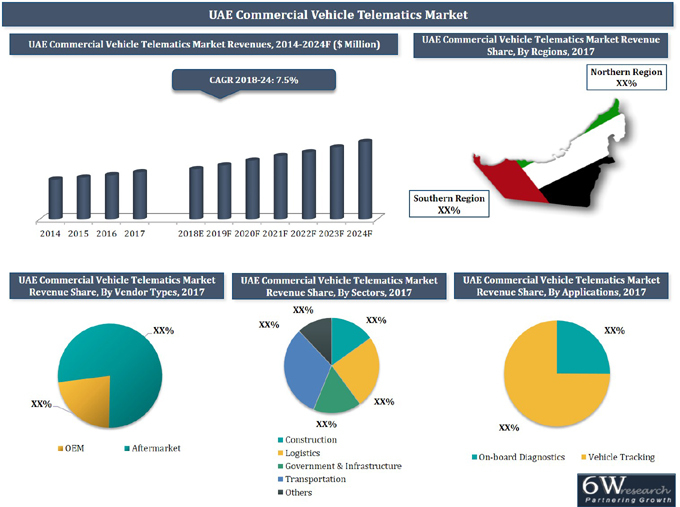 The report thoroughly covers the UAE commercial vehicle telematics market by vendor types, sectors, commercial vehicle types, applications, and regions. The report provides an unbiased and detailed analysis of the on-going trends, opportunities/ high growth areas and market drivers which would help the stakeholders to device and align their market strategies according to the current and future market dynamics. • Historical data of Global Commercial Vehicle Telematics Market for the Period 2014-2017. • Market Size & Forecast of Global Commercial Vehicle Telematics Market until 2024. • Historic data of UAE Commercial Vehicle Telematics Market Revenues & Volume for the period 2014-2017. • Historic data of UAE Logistics Commercial Vehicle Telematics Market Revenues & Volume 2014-2017. • Historic data of UAE Government Commercial Vehicle Telematics Market Revenues & Volume 2014-2017. • Historic data of UAE Transportation Commercial Vehicle Telematics Market Revenues & Volume 2014-2017.